reduces hair loss by encouraging regrowth. 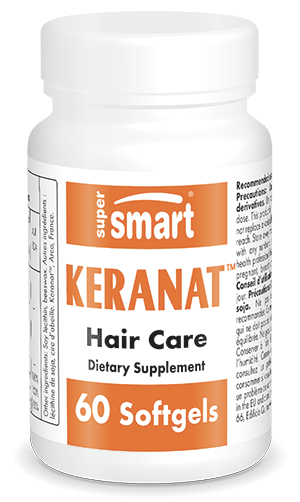 The result of many years’ research, this new supplement Keranat™ is a natural product designed to care for your hair and scalp. It is formulated from a blend of several plant extracts – millet, sunflower, wheat and rosemary - chosen for their content in bioactive compounds such as miliacin and ceramides. These natural active principles have been the subject of numerous scientific studies investigating scalp and hair health. They have also attracted scientific interest for their potential to treat hair loss in alopecia or baldness. A key characteristic of Keranat™ supplement is its content in miliacin, a natural compound that has been investigated extensively in recent years. Present in millet (Panicum miliaceum), this triterpenoid has revealed a number of beneficial effects for hair health and growth. Clinical studies have shown this natural active principle accelerates cell division in the hair bulb, strengthening and encouraging growth of the hair. Keranat™ supplement also contains ceramides, a form of lipid known as ‘polar’ lipids. These fulfil essential functions within the structure of the skin including that of the scalp, such as helping in the cohesion of epidermal cells and in hydrating the skin. In this context, clinical studies have confirmed the benefits of supplementing with ceramides for reducing dryness, flakiness and itching of the skin. As well as improving the health of the scalp, ceramides have also been shown to benefit the hair. Indeed, these lipids are also found in the hair cuticle, the outermost protective part of the hair shaft. Thus ceramides play a role in the structure and protection of the hair. Combining the benefits of miliacin and ceramides, Keranat™ supplement is a proven treatment for hair loss. Clinical studies show that it slowed down hair loss by up to 50% after just three months’ use, and also generated hair regrowth. This supplement thus offers significant therapeutic benefits for treating alopecia and baldness. This new formulation both helps care for your hair and scalp, and combats hair loss. It contains phospholipids to enhance the bioavailability of its active principles, enhancing the product’s efficacy. By forming vesicles around the miliacin, the phospholipids help protect it during its passage through the stomach. The suggested dose for this optimal formulation is one capsule a day. You may also be interested in our other hair care nutricosmetics: Grey Hair Formula, a natural remedy for grey hair, and Hair & Nails Formula, a powerful tonic for the hair, skin and nails. Other ingredients : soy lecithin, beeswax. Keranat™, Arco, France. adults. Take one softgel a day. Contains wheat and a soy derivative.